The Halo Comfort Club is a simple way to make sure your heating and air system doesn’t go out at the most inopportune time. If you’re a member of the Halo Comfort Club, twice a year we come out and perform a check and tune-up on all of the units in your home for only $49 per unit. This keeps your units safe from breaking down in the winter or summer, saving you a lot of headaches, not to mention money. You also get priority when it comes to service/repair as a Halo Comfort Club member and 10% off of any repair work needing to be done! Keep your system tuned-up and your family comfortable just makes sense. 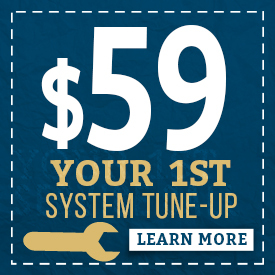 To get your 1st tune-up for just $59 and become a member of the Halo Comfort Club, fill out the information below or call us at (615) 383-4822. Routine maintenance prevents your heating and cooling system from breaking down in the middle of winter or summer, when it’s the most inconvenient and costly to repair. Just imagine what it would be like for your heating unit to go out in the middle of January in Nashville. Imagine if your home was as cold inside as it was outside. Imagine trying to sleep in that. Conversely, think about your cooling system failing you in the middle of July. Imagine having to sit in your home all day when your house is just as hot, and sometimes hotter than the sweltering heat outside. To compound the issue, when your HVAC system goes out in these situations so has everyone else’s system. The middle of summer and winter are the busiest times for HVAC companies in Nashville. It isn’t uncommon for Nashville heating and air contractors to be backed up 1-2 weeks during the summer and winter because other homeowner’s didn’t prepare either. Imagine 1-2 weeks of sweltering heat or freezing cold in your home. Don’t be like everyone else. Be smart and be prepared with the Halo Comfort Club. Enter your details below and expect a Halo Heating and Cooling technician to call you! We know that when your heating/cooling is out, there's no time to waste. Fill out this form below or call us at (615) 383-4822 and we'll contact you ASAP! Don't forget to mention the Halo Comfort Club!